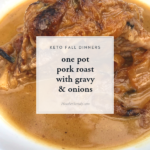 You might be surprised how well pork roast and gravy go together. 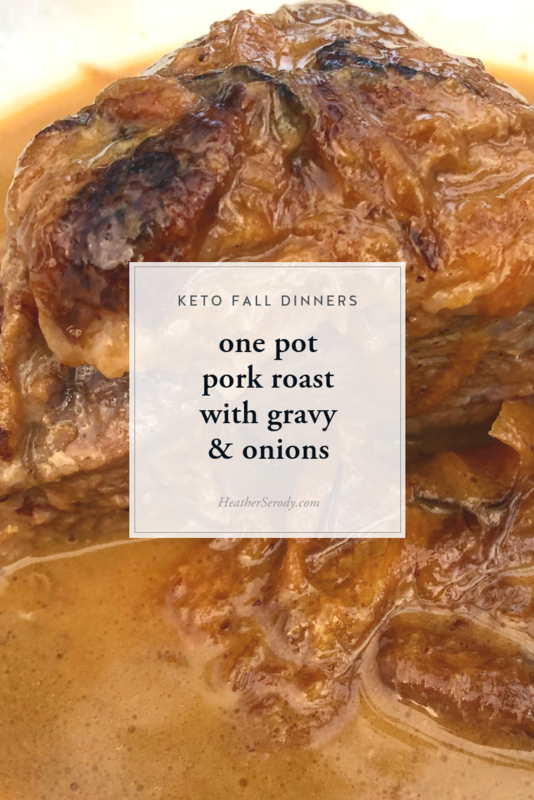 This simple recipe requires browning the roast all over in a dutch oven (heavy-bottomed covered roasting pot) to seal in the moisture. You'll braise it right on the stovetop with onions & stock. Thirty minutes before it's done you'll remove the lid to reduce the cooking liquid. Adding some cream to the cooking juices right in the pan makes the gravy super easy to make. This is a warm, savory, and satisfying meal for Fall and pairs well with my walnut blue cheese radicchio endive salad. Allow the roast to come to room temperature before searing. I get all my organic and free-range meats delivered from Butcherbox – highly recommend! Remember to give yourself plenty at least two hours to fully roast your pork to tender. I love my Le Cruset dutch oven. It's an investment piece you'll have for a lifetime. Get a deep one that can hold large roasts. Sprinkle the pork roast all over with sea salt and pepper. Heat the oil in the Dutch oven on medium heat. Brown the pork roast well until the roast is browned all sides, about 8 minutes. Add the onions, stirring until they soften; about 5 minutes. Add the stock. Cover and simmer over low heat for two hours (more if you have a larger roast). Remove the lid and cook for another 30 minutes, or until the cooking juices have condensed and reduced down by at least half. Remove the roast and set aside to rest. Add heavy cream to the cooking liquid and whisk to combine, pulling up any browned bits from the bottom of the pan. Slice the meat and serve it on a high sided platter with the gravy & onions spooned over top. Serve immediately. Previous Post: « Real Good Pizza Giveaway!